Thank you for making my scenario come to life. Let me know if you have any more awesome ideas that need Magicking. Ok, so Get to the Chopper V2.1 is in the downloads section. Its done up in A4 and in US Letter size PDFs. Each one is 2 pages. There is a Scenario sheet that can be printed as a single sheet, or can be printed and cut to make a 4x6 double sided scenario card. 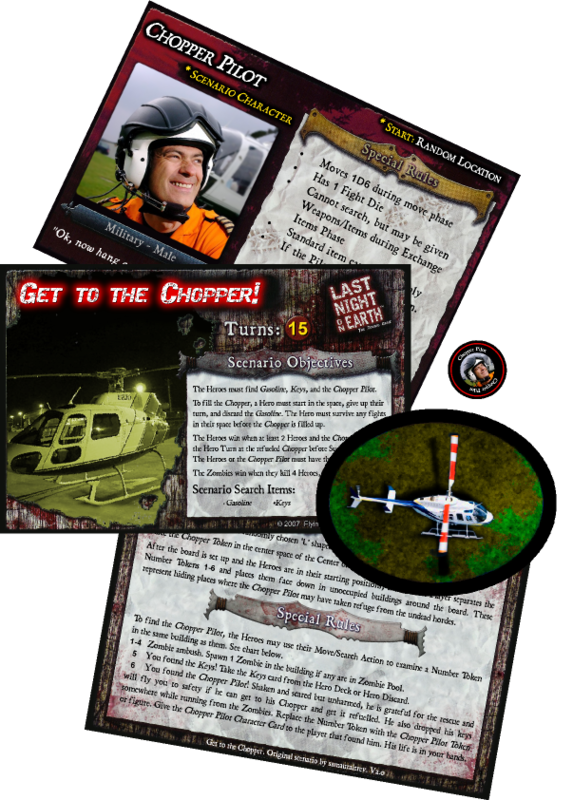 The second page includes a Scenario Character card for the Chopper Pilot, and Tokens for the Pilot and the Chopper. Now whoever saves the pilot, gains control of him and must keep him alive to fly them out of there. I hope to give this revised version a play soon. I will play this scenario and post a game for my next report. +1 Rep for the help and the new tokens. You just let me know when you've got an idea, and I'll try and bring it (back?) to life. Looks cool! Will have to try it out sometime.